Sequence of clam garden construction, (a) Naturally sloped, unmodified beach. (b) Infilled clam garden terrace. Not all clam beaches are clam gardens. There are a variety of features associated with clam harvesting and management. 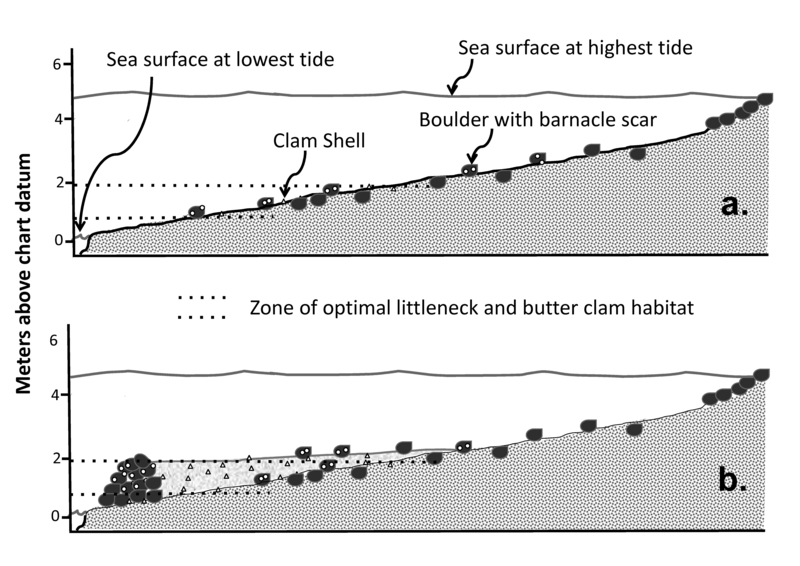 Some naturally productive clam beaches have no obvious evidence of human modification, whereas other beaches were altered by humans by clearing and piling boulders to the edges of the beach. At other beaches, there are the rock walls and terraces of clam gardens. Sometimes rock walled clam gardens will be constructed where there was little or no former clam habitat (such as on bedrock), while other times the rock wall and terrace will augment and expand a pre-existing clam beach. On some pre-existing clam beaches, clam garden walls were built over time, through the process of beach clearing associated with regular clam harvesting. At other locations, clam garden walls were built during a single engineering event and maintained over time as people rolled rocks to the low tide line while digging for clams. At a place called Klelung, or Orcas Island, there is a clambed cultivated by its owners. They took the largest rocks that were in the clam bed and moved them out to extreme low water marks, setting them in rows like a fence along the edge of the water. This made clam digging very easy compared to what it had previously been because there are only small pebbles and sand to dig in. It is exceptional to cultivate clam beds in this manner and while other clam beds are used by everyone in the tribe, here only the owners who cultivated the bed gathered. Excavated clam garden walls showing (a) the stones placed at the base of the wall and (b) a clam trapped during the building of the wall that could be used to date wall construction. Photos: Dana Lepofsky.